Carl Herman worked with both US political parties over 18 years and two UN Summits with the citizen’s lobby, RESULTS, for US domestic and foreign policy to end poverty. He can be reached at Carl_Herman@post.harvard.edu Note: My work from 2012 to October, 2017 is on Washington’s Blog. Work back to 2009 is blocked by Examiner.com (and from other whistleblowers), so some links to those essays are blocked. If you’d like to search for those articles other sites may have republished, use words from the article title within the blocked link. Or, go to http://archive.org/web/, paste the expired link into the box, click “Browse history,” then click onto the screenshots of that page for each time it was screen-shot and uploaded to webarchive (blocked author pages: here, here). Criminal conviction requires “beyond reasonable doubt” and a civil judgement requires “preponderance of evidence”. These differences in burden of proof make a civil defendants favorable outcome more likely. There is no Fifth Amendment protection from self incrimination for the plaintiff. Fetzer demand for discovery and depositions will blow the lid off the Sandy Hoax septic tank. OK, what if they go through discovery and it turns out Noah Pozner did exist and Lenny Pozner is who he says he is. What then? Adding the 666 in the passport number to the motion is silly and will just make Fetzer look like a crazy conspiracy theorist in court. Bob: please view the 65-minute video in this article that explains the evidence in this case. Your concern is unlikely, but even if true, a reasonable jury will conclude that the mountains of evidence support any American of intellectual integrity and moral courage to challenge the government’s “official” story about Sandy Hook. Anyone interested in the facts must invest the time to learn them. This 65-minute video is a great start for the curious. Seen it, any court will be able to see that Noah and Michael’s ears do not match. Then there’s the Mother’s Day 2012 photo of all five Vabner/Pozner children. Are you aware that photoshop can change ears and photoshop can be proven easily? Trying to discredit photoshop is a psychological manipulation technique compared to the CIA’s disinformation labeling conspiracy theories as untrue. Another technique you people use is debunking evidence that proves shootings were not real without explaining how the hell it was debunked. When we debunk the debunker it is ignored. I have to give you credit for being a great BS artist. Did you know that it’s possible that the ears could be different because they’re simply two different people? We are confronted with two alternatives: (h1) the photos are real and, even though they show someone with the same eyes, the same eyebrows, the same nose, the same mouth, the same hair, the same shape of cranium, the ear variation shows they are nevertheless two different persons; or (h2) the photos are real and show someone with the same eyes, the same eyebrows, the same nose, the same mouth, the same hair, the same shape of cranium, but where the right ear was tweaked in an effort to justify the claim that these are really two different persons. I don’t think anyone would buy (h1) over (h2). They are too strikingly similar not to be one and the same person, where the tweaking would be just the sort of thing that perps would do to contest the obvious truth. The probability of (h1) is low, while the probability of (h2) is high. The alleged image of “All five Vabner/Pozner children” and Nancy Lanza’s alleged purchase of the Bushmaster XM15 – the alleged school murder weapon. Mother’s Day 2012 was on May 13. The “Sandy Hook narrative” alleges that the weapon used to allegedly murder the staff and pupils at the school was the Bushmaster XM15-E2S assault weapon. The narrative alleges that Nancy Lanza bought the Bushmaster XM15 on March 29, 2010 from Riverview Gun Sales in East Windsor, CT.
Carl: Bob is a shill whose comments are disinformation and misrepresentations. I\’ve been dealing with his type for over a decade. They hang around sites like this and ignore the obvious truths and facts but like to snipe at little side issues like ears and long ago scrubbed photos. Scrubbed photo? Go look at Danielle Vabner’s Twitter feed, you’ll see the photo of all the children and many others of her with Noah. They could say the exact thing about your “type”. You don’t consider any of the mountains of evidence showing Fetzer’s claims to be bunk. Every single chapter in his book has proven to be filled with easily disproven claims. Just go to crisisactorsguild or sandyhookanalysis and type Fetzer in the search bar. While we made some relatively minor mistakes, such as asserting the photo of the SWAT (or Crime Scene) vehicle at the school before the alleged shooting was taken on the morning of the event, when it turned out to be the evening before, that error does not affect the import of the vehicle being present with crime scene tape already up BEFORE THE CRIME HAD BEEN COMMITTED. I know you and yours like to say there was damage to one of the windows, but it was minuscule and completely unlike the condition of the windows AFTER THE EVENT, which we also present in Ch. 8 of NOBODY DIED AT SANDY HOOK (2015). You trade in trivialities and ignore the powerful proof that this was an elaborate scam, a 2-day FEMA exercise involving children to promote the political agenda of Barack Obama, Joe Biden and Eric Holder. Your book Mr Fetzer, also says there was crime scene tape up before any glass was broken, not true. You book shows Adam’s “New England ID card”, that actually was just a prepaid Amex card. Your “minor mistakes” occur in every chapter. Can you explain the photo of the five Vabner/Pozner children Mr Fetzer? You have still not explained all the mistakes in the “FEMA” manual. Bob, I can only handle so much silliness at one time. I notice you are not talking about the difference between the ears of “Noah” and of Michael, which was dealt with in my Second Request for Admissions. We will get around to other of the issues you raise. In fact, I like having you here as a guide to what you and yours take to be your best shots against the truth about Sandy Hook! Why are there no photos of the Lanza brothers in one photo? Is it because there were no brothers? Why are there no photos of the Lanza brothers at the now destroyed Lanza house? Why was the perfectly good Lanza home destroyed? Why was the Sandy Hook school destroyed with the destruction crew sworn to secrecy ….for life? Why was the car that \’\’Adam\” drove to the school registered to a local drug dealer.\”? Why have we never seen the Lanza father speaking in a TV news video? Why did the DOJ give the CT State Police a grant of almost 2 million dollars 2 months before the Hoax day? Why did FL police visit Wolfgang Halibig\’s home in FL and tell him to \’\’keep his mouth shut\”? Why did Mark Zuckerberg of FaceBook delete my account when I wrote that Sandy Hook was a hoax about gun control? Why did Amazon dot com ban Mr Fetzer\’s book about the Sandy Hook Hoax? Amazon does not believe in the 2nd Amendment? The school was not demolished for a year, it\’s not like they immediately destroyed it. Not everyone wants media attention, Peter Lanza may just want to talk about it. The Lanza home was destroyed mores than two years later, destroyed immediately then you might have something. A home where a woman was murdered by her son, who also killed 26 other people, is not a perfectly good home. Convenient for you that the video with the claim the cars were from an impound lot, was removed. No other evidence to back up the claim? There is a portion of Fetzer\’s book blatantly ripped off, copyright was why it was banned. His other books are still there. Yesterday Don, you said there State police uniforms in Nancy\’s closet. Any photos to prove that? Where do you come up with this nonsense, Bob? Really! The book was banned because it blows the “official narrative” apart. Did you miss the memo about First Edition contacting me, claiming that they wanted to feature what we had discovered about Sandy Hook, but I had to do a “preinterview” first–and I found myself in a basement operation at Langley, where a professional interrogator asked me, again and again, “What have you got?” and then, “What else have you got?”, until he was convinced that we had too much. The book was banned about 36 hours later. You make up loads of bull, Bob. But I haven’t heard this song-and-dance about part of the book being “ripped off”. Are you talking about Ch. 7 and Ch. 8, which are photos from the CT Police Files, which are public records available to everyone? and which happen to prove–beyond a reasonable doubt–that the CT State Police were running the op behind the scenes? It’s great having you here. You are some piece of work. Ahhhh. That’s very interesting. I tried to reach him but without success. I thought, since Sandy Hook was being used to promote gun control, he would be glad to be included. I was surprised but complied when he objected and went ahead with the 2nd edition without his appendix, which shows that, when guns are banned, crime goes up. I wonder if he has read the book, which he obviously had not when he declined its inclusion. It may turn out to be the most famous book with which anything he has written will ever be associated–but that was his preference. No serious student today believes it was real, only trolls like you even profess it. And that’s clearly essential to your game plan. LOL, I thought you didn’t use the Photoshop excuse? So you are telling me that, if we prove that some of these photos have been shopped, as in the case you have been touting since you first arrived here, WE CAN’T POINT IT OUT AS PROOF? So you want to have the opportunity to photoshop lots of phony evidence but if we are able to PROVE something’s photoshopped, that’s some kind of EXCUSE? I am sorry, Bob, but you are betraying yourself here. Keep it up! Glad you’re here. You are doing terrific! The only proven photoshopped photo is the one Alyssa Parker admitted too, the others are speculation. The only sources who could make such a claim would be those involved in faking the photographic record. It implies knowledge you could not possibly possess–and is even provably false, since, in my Second Request for Admissions from the Plaintiff Leonard Pozner, I provide proof that the ears of “Noah” were tweaked to make them somewhat different from the ears of Michael, which you knew because you were involved in faking the evidence! What other explanation could there be? Again and again, you display (or claim to possess) kinds of knowledge only available tot he perps. Glad to have you here, Bob. You are a fascinating source of information (though not exactly the information you intended to supply)! We’re learning a lot from having you here! Who is the little boy in the Spiderman video on Pozner’s Youtube channel? The movie came out in 2002, Michael would have been seven at the time. The little boy in the video does not sound like a seven year old. Bob, you’ve got all the answers, why don’t you tell us what happens when/if Noah and Lennie really exist? Why does Dr Fetzer have to do your job, anyway? Waiting for your answer, Bob…. He has no case anyway, but it will fall apart. Going into court with “666” passport number satanic theory isn’t going to cut it. He’ll need more than photos, that in his opinion, show one person looking like another person. Maybe he’ll bring Dallasgoldbuig in to testify, goldbug can use his “skills” to help out. Carl is brilliant at statistics, so I’ll let him take care of this one. But you are overdoing it, Bob. Really! It’s probability by chance “666” would be remote. He has done is stats before, without evidence that Sandy Hook children were older than what we were told, Carl’s stats are meaningless. We need more than that photo Wolfgang tweeted of the teenage girls. He won’t answer questions about where that photo came from or when/where it was taken. “predominance of evidence”……convenient of you to forget this. Ultimately, all shills sound exactly like you. After a while, shills get impatient and start to act stupid. Then, they start to make stupid assumptions and fabrications. Jig is up, Bob. Gave it your best shot but your gun was empty. 2. A 666 number by itself has one chance in 1,000 of occurring from 000 to 999. 3. Hey, Bob, what do you mean by, “He has done is stats before, without evidence that Sandy Hook children were older than what we were told, Carl’s stats are meaningless.” Are you claiming the statistical probability of 20 alleged mothers averaging a birth age of 36 is meaningless? If so, please explain. 4. And Bob, just curious, if you were on the jury for the narrow question in the first paragraphs of this article whether the death certificate was altered, would you find with Jim that it has been altered as Jim points to, or would you find with the plaintiff that there is no alteration? The idea of the mothers were too old to be the mothers of the Sandy Hook kids, is based on the theory that the children were older than what we were told. There is no evidence of that. There is opinion that some older kids look like the Sandy Hook kids, but not evidence. Based on the images of other death certificates you can Google, it’s real. You can get a copy of it for yourself for $20. Is it worth $20 to you to try to prove it’s fake? Bob, are you intellectually deficient? The argument was that, since their average age was 10 years older than would have been expected for mothers of six year old children, something was wrong. Not that the alleged decedents were ten years older but that they were faking the dead kids, which turns out to be correct. I am baffled why you continue to make a fool of yourself here. Ok, Bob, we all see your “argument” addressing the average birth age of the 20 alleged mothers at 36 years old generating impossible odds in numbers so big we don’t know how to say it. Believe whatever you want. I won’t invest further time with you. But nothing is wrong Mr Fetzer, the children were the ages we were told, neither Carl’s stats nor your evidence changes is that. Try to find out from Wolfgang, where and when the photos of the teenagers was taken. Or contact the person who was the first to tweet the photo. I am going to look at this one, Bob. Thanks for that. But it never ceases to amaze me that someone like you would come onto a public forum and make one ridiculous and indefensible argument after another in DEFENSE of an OBVIOUS SCAM. You love to leap-frog over evidence, but you cannot cope with even the first five minutes of the video embedded in this blog. You can’t even deal with the photo of the wooden exit, which no wheelchair could navigate, which demonstrates CONCLUSIVELY that the school could not have been legally operating in 2012 because it was in violation of state and federal laws for Americans with Disabilities. You are as fake as Sandy Hook! A single photo eposes you! Why would a school supposedly closed, have food delivered there on 9/06/12? That is one of the documents Halbig received and tweeted out. Bob, you know so much in such detail that one might be tempted to infer that’s because you were in on it and now want to defend your handiwork! Are we supposed to weigh the direct, simple proof of a wooden stairway exit that no wheelchair could navigate–which proves that the school was not in compliance with Americans With Disabilities Act requirements, which by itself shows the school cannot have been legally operating in Connecticut in 2012–with documents about food delivers that can easily be faked? Surely you jest. Wolfgang has become an expert in this area, where I expect he will make an imposing witness at the trial. Keep us posted, Bob. You are making quite an impression! Halbig circled the area on the right that he wants you to focus on. The April 2012 date and the Chalk Hill address. What he missed is on the right side. It says the invoice was created 8/27/12, but modified 1/02/13. The students started at Chalk Hill on 1/03, because of that the database had to be changed to reflect the new school address. Once the database was modified, any invoice was going to show the Sandy Hook address as Chalk Hill instead of Dickinson DR. There are 2 screen shots in that composite image, the left image and the right image. So, the left hand screen shows very clearly that one of the Ship To addresses for this customer is being maintained. Customer addresses such as invoice & ship to addresses are known as master data. Customer master data is not transaction data, like an order or a delivery or an invoice. The right hand image shows another Customer Master data maintenance screen. This screen is used to maintain free form textual notes held against customer master data addresses, such as Bill To & Ship To addresses. It is not possible to definitively determine whether the text as shown on on the screen on June 4, 2018 was in fact the original text created on August 27, 2012 or was subsequently changed. We know that the text was last modified on February 1, 2013 but we cannot determine what changes to the original text were made on that date. We do know that the modification made to the text on February 1, 2013 resulted in the text shown on June 4, 2018. But, we do not know what the text was before the modification was made. The original text could have been similar or completely different, we just do not know. It is unclear whether the “Created : 4/26/12” date refers to the Bill To party, “659295 COMPASS GROUP ( VND #942217 )” or if it refers to the new Ship To party for the Sandy Hook School shown located at Chalk Hill Middle School in Monroe. If it relates to the Bill To party, then it would imply that Compass became a customer of this supplier in April 2012. If it relates to the new Ship To party shown on the screen as Sandy Hook relocated to Chalk Hill Middle School in Monroe, then that would confirm that the re-location was actioned on the system in April 2012 ! No it does not. It says nothing about an invoice. Bob is completely wrong. This is an entirely wrong interpretation and is a result of Bob’s misunderstanding of these screens and their purpose. Deliberate or otherwise, Bob has confused a “Customer Notes Maintenance” screen with an invented assumption of an invoice screen. The right hand image screen title clearly shows “Customer Notes Maintenance” and has nothing to do with transaction data such as an invoice as Bob erroneously claims. Neither of the two screens shows any invoice data whatsoever. Both screens are Customer master data maintenance screens and have nothing to do with invoices. While I see no value in anyone any longer responding to, giving time and attention to, the Bob’s postings, your explanation, Mark Gobell, of where the Bob went wrong in his interpretation, was quite good and quite helpful. The Bob’s misinterpretation was no real misinterpretation at all but was a disinterpretation. Thank you DachsieLady – I am happy that it was clear. Some web searching reveals that Sysco Connecticut, LLC were awarded the food supply contract( No. 9PSX0330 ) by the CT State on 4 October 2010 ( until 31 October 2019 ) to the value of some $19.5 millions. I have not been able to ascertain the nature of Sysco’s IT infrastructure, vis Sales Order processing and distribution, but search results do provide some insight into some of their capability and as one would expect in this day and age, all seem to be modern, browser based systems. To see that such a major company still relies on legacy technology such as character based green screens, is a major surprise. During my travails through the “Jo Cox” narrative, the UK MP allegedly murdered by Thomas Mair in 2016, we were presented with some delivery / dispatch notes, allegedly detailing various book orders supplied to the alleged perp, Thomas Mair by the National Alliance’s book sales division, National Vanguard. These facsimiles were presented to the world by the SPLC in the US within hours of the alleged crime being committed in the UK ! Analysis soon proved that they were likely fabrications, produced to incriminate the hapless Thomas Mair. The real perps’ slavish compulsion to Kabbalise their narratives is imo, their principal achilles heel. Since the narratives are produced by software, they don’t have much choice in the matter, since the rules for the relationships between events are coded, as ever, based on rules and so therefore the tell-tale relationships remain consistent across all narratives. Fabrication on paper, as we know, is an art as old as time. Dean Foods sent them to Halbig and he tweeted them. It appears that Dean Foods were using legacy green screen type systems after all. This 2016 article explains that they used Oracle’s JD Edwards ERP / LANSA systems, which used the legacy type “green screen” terminals. All of the text / claims appearing under the section : (2) Food service invoice – can be ignored. The interpretation is wrong for the reasons I have stated above. The one caveat, as I indicated earlier, is if the “Created Date of April 26, 2012” shown on the screen, relates to the Bill To party master data or to the Ship To party master data. If it relates to the Bill To party, that would imply that Sysco did not become a customer of Dean Foods until that date. So, it’s no surprise that this erroneous interpretation of the dates on the screen shot has been repeated. So, you are saying adding the 666 notation in court has never been done? Are you a loyer and do you know what all judges would do with Fetzer in court? Just how do you know this, being the shill that you are? Sooner or later, shills identify themselves by their zany shenanigans, lousy spelling, and horrible syntax. Congrats, you are now officially “there”. I’m saying adding the satanic theory into it, will just make Fetzer look like a crazy conspiracy theorist to the court. Unfortunately most jurors have no idea exactly what those two requirements mean. People get confused on a Jury because they have seen too many CSI TV shows. They expect to see videos of the crime in order to convict or some other type of ridiculous evidence . Jim Fetzer is a hero. These lies, deception, hoaxes need to be exposed to the truth and he has done that. My sentiments are with Jim Fetzer he should get a standing ovation from every single American. Bob is merely probing to get an idea how much his opponents know about the farcical nature of the Hoax and its coverup. His questions are not merely matters of curiosity on his part. He has no innate curiosity, he’s getting paid from the perps to play this game with those who question him. He’s no random amateur seeker of information,he has reasons as to why he’s making it sound like he’s a poorly educated dope. His spelling is lousy, his syntax is puerile, and he’s trying to make people believe he’s just a hayshaker who has mild curiosities about the event and its blatant coverup. The sly grins of the state police when Herr Doctor Carver goes through his gibberish explanation is case in point. People don’t grin following ” haha heinous crimes”but the state police high muckeymucks did.I don’t remember seeing this observation in print before, but I may just not have seen it it print. The coverup was and still is extremely crude and depends on the rotten MSM to keep stoopid Americans from catching on to the actual facts behind the event. Bob needs to be shunned and while it seems eminently fair to be conversing with him as a courtesy, Bob does not deserve the time of day.MSM has failed us again, what did we expect from these traitors? Bob’s insights could be seen again…..in court. As in loose lips sink ships….. I consider what could be the optimal outcome for Dr. Fetzer’s effort in the lawsuit. 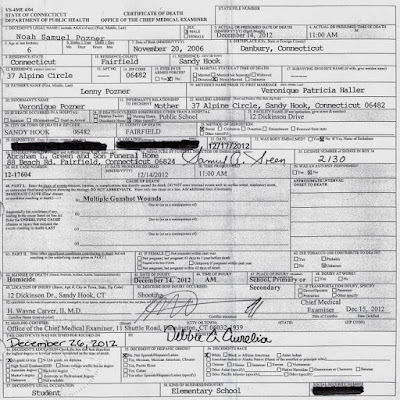 The optimal outcome for Sandy Hook truth and justice seekers would be to have the death certificate exposed to full scrutiny and verified for authenticity in the court proceedings. Then we would have something substantial to point to in our evidence collected over the years. Team Pozner have filed enough of these spurious civil lawsuits all over the country that they have their ways of exiting from the case without ever having the core evidence in question fully adjudicated down to a fine science. There is, however, some Sandy Hook truth and light in just following closely Team Pozner’s weasel filth moves every step of the way. The Pozner Team seems to always be a so-show in Court just at the time things are getting too hot for them. Jim Fetzer has the patience of a saint to deal with these courtroom clowns. Yes, Mr Halbig lives in FL. so why would local FL police make a visit to his home to try and stop him from writing and talking about something that happened or didn’t in another state?? Was the State of CT in a panic and worried that Mr Halbig was on to something very big? Did CT cops call FL and suggest that FL police try to scare Mr Halbig into silence? Having police come to your house is not a pleasant experience. Mr. Halbig is a former police officer so he is not intimidated by cops….he knows the games they play. The vaunted Connecticut State Police stand to lose their reputations very soon after Fetzer’s slamdunk. 2 million bucks from DOJ 2 months before the Hoax, er, event? Don, two days ago you said there were state police uniforms in Nancy Lanza’s closet, do you have photos to back that up? Nancy Lanza’s alleged purchase of the Bushmaster XM15 and the Las Vegas shooting – Stephen Paddock’s alleged purchase of guns from http://www.gunsguitars.com and the Columbine School shooting. The analyses of these narratives shows in abundance that the scripts are constructed using key dates associated with the alleged narrative events. This commonality between different scripts is seen often and is interpreted as “event continuity”, common event dates shared between scripts because the root(s) to those events are shared. See also : Nancy Lanza’s alleged purchase of the Bushmaster XM15 and the Las Vegas shooting : Stephen Paddock’s alleged purchase of guns from http://www.gunsguitars.com and the Columbine School shooting. The analyses of these narratives shows in abundance that the scripts are constructed using key dates associated with the narrative events. The Las Vegas shooting narrative alleges that Stephen Paddock bought his guns from Guns & Guitars in Mesquite, Nevada. The use of Prime Ordinals in date arithmetic. Research has shown, in abundance, that the tell-tale Kabbalistic date arithmetic uses Prime Ordinals or Prime Sequence Numbers together with natural numbers. So, instead of using the natural number, in this case, 666, the natural number values of Prime Numbers P666 ( 4973 ) and PP666 ( 48337 ) can be used also to facilitate date arithmetic with much larger values, whilst retaining the 666 Kabbalistic imperative. The \”Sandy Hook narrative\” alleges that the weapon used to allegedly murder the staff and pupils at the school was the Bushmaster XM15-E2S assault weapon. The Bushmaster XM-15 series ( or XM15 ) is a line of AR-15 style semi-automatic rifles, carbines, and pistols manufactured by Bushmaster Firearms International. A XM15-E2 was captured from Islamic State fighters in Sinjar Mountains by Peshmergas during Iraqi Civil War. The company\’s product line revolves around semi-automatic pistol and rifle variants of the M4 / AR-15 design. Remington Arms Company, LLC is an American manufacturer of firearms and ammunition. It was founded in 1816 by Eliphalet Remington in Ilion, New York, as E. Remington and Sons. Remington is America\’s oldest gun maker and is claimed to be America\’s oldest factory that still makes its original product. Remington is the largest U.S. producer of shotguns and rifles. The company has developed or adopted more cartridges than any other gun maker or ammunition manufacturer in the world. Until 2015, Remington Arms was part of the Freedom Group, [ 3 ] which is owned by Cerberus Capital Management. In 2014, a new plant was built in Huntsville, Alabama to produce AR-15 style semi-automatic rifles and Remington 1911 R1 pistols. [ 4 ][ 5 ] In 2015, the Freedom Group was renamed as Remington Outdoor Company. Remington filed for chapter 11 bankruptcy protection, in March 2018, having accumulated over $950 million in debt. Remington exited bankruptcy in May 2018, less than two months after filing for protection under Ch. 11 laws. Remington\’s quick exit from bankruptcy was due to a pre-approved restructuring plan that was supported by 97% of its creditors. On February 17, 2014, Remington announced a plan to build a new state-of-the-art plant in Huntsville, Alabama. Remington decided to move two production lines from the Ilion, New York plant as a result of the fallout from the New York Safe Act, which restricted gun ownership. [ 2 ][ 5 ] Huntsville is now building the AR-15 style semi-automatic rifles from Bushmaster, DPMS, and Remington R-15 and 1911 style R-1 pistols in the new plant. Eliphalet Remington ( October 28, 1793 – August 12, 1861 ) founded what is now known as the Remington Arms Co., L.L.C. Originally the company was known as E. Remington followed by E. Remington & Son and then E. Remington and Sons. On the Google+ website, https://plus.google.com/+LennyPozner, there are various photos of the toddler child we have come to know as Noah Pozner. All carry posting dates and some have another textual date in the title, presumably of when the photograph of the child was taken. Presumably, because of the widespread doubt as to the veracity of the Sandy Hook narrative, the textual dates of the photographs serve to reinforce the assertion that the child pictured, is a child called Noah Pozner, who was the age he looks to be when the photo was taken. Why else would the world need to know the dates that these photographs were taken ? The Noah Pozner narrative : favorite song : Gangnam Style : PSY and Barack Obama and Theodor Herzl. The Noah Pozner narrative : favorite song : Gangnam Style and Mayer Amschel Rothschild. The Noah Pozner narrative : favorite song : Gangnam Style and the Holocaust narrative Anne Frank. The Noah Pozner narrative : favorite song : Gangnam Style and the First Zionist Congress Theordor Herzl and the Basle Declaration. The Noah Pozner narrative : favorite song : Gangnam Style and Noah Pozners death certificate. The Noah Pozner narrative avers that his favorite song was Gangnam Style by the Korean popster, Park Jae-sang aka Psy. \”Gangnam Style\” is the 18th K-pop single by the South Korean musician Psy. The song was released on July 15, 2012, as the lead single of his sixth studio album Psy 6 (Six Rules), Part 1, and debuted at number one on South Korea\’s Gaon Chart. PSY, is a South Korean singer, rapper, songwriter, and record producer. Psy is known domestically for his humorous videos and stage performances, and internationally for his hit single \”Gangnam Style\”. Sandy Hook : Ryan Lanza and the American Nazi Party founder, George Lincoln Rockwell. Recall that, immediately after media stories began to be published about the alleged event, there was confusion as to the identity of the alleged shooter. Confusion surrounding the identification of the suspect in the Sandy Hook Elementary School shooting mounted as the day went on. Earlier, a law enforcement official mistakenly transposed the brothers’ first names. Fox News today broadcast multiple Facebook photos of one Ryan Lanza, claiming he was the same Ryan Lanza law enforcement officials had initially* identified as the gunman in today’s shooting at a Newtown, Conn., elementary school. Lanza’s mother, Nancy Lanza, was presumed dead. Ryan Lanza, the shooter’s 24-year-old brother, was being questioned by federal authorities at his apartment in Hoboken, N.J., after a wave of confusion in which multiple media outlets mistakenly identified Ryan Lanza as the shooter. EDITOR’S NOTE: Following hours of uncertainty during which many media outlets reported the shooter’s identity as Ryan Lanza, officials identified the gunman as Adam Lanza. According to WNBC, Adam Lanza was carrying his brothers’ identification, which led to the initial misidentification. Adam Lanza’s brother, 24-year-old Ryan Lanza, is being questioned by police in New Jersey. CNN has identified the alleged gunman at Sandy Hook Elementary School http://www.huffingtonpost.com/2012/12/14/sandy-hook-elementary-school-shooting_n_2300831.html in Newtown, Conn. as Ryan Lanza. George Lincoln Rockwell ( March 9, 1918 – August 25, 1967 ) was an American politician, founder of the American Nazi Party. Nancy and Peter’s first son, Ryan John Lanza, was born on April 10, 1988. Concerning the informational referenced picture links of food deliveries, the food and quantities are not consistent with a school of 500+ students. The small amounts are typical for a group of approx. 100+- people. Apples, oranges, strawberry yogurt, hot dogs, pizza, potato chips, cheese treats, foam trays, …..partytime food. These are exactly the kinds of foods that were reported to have been served to the participants on Hoax Day at the Sandy Hook school. There are photos of people handing out the food from a doorway at the Fire Station. Also there are helicopter aerial photos of people standing outside the Fire Station eating the food. When the State of CT and DHS, etc. puts on a Drill – Fake Shooting event they make sure people have snacks and refreshments. Lets not forget the ubiquitous bottled water [photographed stacked to the ceiling in the Fire Station] and the trucked in Port-a-Potties. At Columbine, the Red Cross brought water for the first responders. Some fire dept’s have canteen trucks that bring food/water to the fireman. So anyone bringing food/water for the responders at Sandy Hook is not odd. The document I posted was from Sept 2012, they would not deliver food in Sept for an alleged drill happening three months later. “Gangnam Style” is the 18th K-pop single by the South Korean musician Psy. The song was released on July 15, 2012, as the lead single of his sixth studio album Psy 6 (Six Rules), Part 1, and debuted at number one on South Korea’s Gaon Chart. Park Jae-sang ( born December 31, 1977), known professionally as Psy , stylized PSY, is a South Korean singer, rapper, songwriter, and record producer. Psy is known domestically for his humorous videos and stage performances, and internationally for his hit single “Gangnam Style”. The song’s refrain was entered into The Yale Book of Quotations as one of the most famous quotations of 2012. Theodor Herzl also known in Hebrew as חוֹזֵה הַמְדִינָה‬, Chozeh HaMedinah, lit. “Visionary of the State”; ( 2 May 1860 – 3 July 1904) was an Austro-Hungarian journalist, playwright, political activist, and writer who was the father of modern political Zionism. Herzl formed the Zionist Organization and promoted Jewish immigration to Palestine in an effort to form a Jewish state. Though he died before its establishment, he is known as the father of the State of Israel. While Herzl is specifically mentioned in the Israeli Declaration of Independence and is officially referred to as “the spiritual father of the Jewish State”, i.e. the visionary who gave a concrete, practicable platform and framework to political Zionism, he was not the first Zionist theoretician or activist; scholars, many of them religious such as rabbis Yehuda Bibas, Zvi Hirsch Kalischer and Judah Alkalai, promoted a range of proto-Zionist ideas before him. Der Judenstaat (German, literally The Jews’ State, commonly rendered as The Jewish State) is a pamphlet written by Theodor Herzl and published in February 1896 in Leipzig and Vienna by M. Breitenstein’s Verlags-Buchhandlung. It is subtitled with “Versuch einer modernen Lösung der Judenfrage” (“Proposal of a modern solution for the Jewish question”) and was originally called “Address to the Rothschilds”, referring to the Rothschild family banking dynasty, as Herzl planned to deliver it as a speech to the Rothschild family. Baron Edmond de Rothschild rejected Herzl’s plan, feeling that it threatened Jews in the Diaspora. He also thought it would put his own settlements at risk. It is considered one of the most important texts of early Zionism. As expressed in this book, Herzl envisioned the founding of a future independent Jewish state during the 20th century. He argued that the best way to avoid antisemitism in Europe was to create this independent Jewish state. The book encouraged Jews to purchase land in Palestine, although the possibility of a Jewish state in Argentina is also considered. Herzl popularized the term “Zionism”, which was coined by Nathan Birnbaum. The nationalist movement culminated in the birth of the State of Israel in 1948, but Zionism continues to be connected with political support of the State of Israel. 3. The “Noah Pozner” narrative : favorite song : Gangnam Style and Mayer Amschel Rothschild. Mayer Amschel Rothschild, written also Anschel ( 23 February 1744 – 19 September 1812 ), was a German Jewish banker and the founder of the Rothschild banking dynasty. Referred to as a “founding father of international finance,” Rothschild was ranked seventh on the Forbes magazine list of “The Twenty Most Influential Businessmen of All Time” in 2005. The Office of Strategic Services (OSS) was a wartime intelligence agency of the United States during World War II, and a predecessor to the Central Intelligence Agency (CIA). The OSS was formed as an agency of the Joint Chiefs of Staff (JCS) to coordinate espionage activities behind enemy lines for all branches of the United States Armed Forces. Other OSS functions included the use of propaganda, subversion, and post-war planning. Annelies Marie Frank ( 12 June 1929 – February or March 1945 )  was a German-born diarist. One of the most discussed Jewish victims of the Holocaust, she gained fame posthumously with the publication of The Diary of a Young Girl (originally Het Achterhuis in Dutch; English: The Secret Annex), in which she documents her life in hiding from 1942 to 1944, during the German occupation of the Netherlands in World War II. It is one of the world’s most widely known books and has been the basis for several plays and films. For her thirteenth birthday on 12 June 1942, Frank received a book she had shown her father in a shop window a few days earlier. Although it was an autograph book, bound with red-and-white checkered cloth and with a small lock on the front, Frank decided she would use it as a diary, and she began writing in it almost immediately. The date calculator cannot show INTerval type date calcs ( whole days between dates ), so the result date is always shown as one day short. Two URL’s are required to show INClusive date calcs. 4. The Noah Pozner narrative : favorite song : Gangnam Style and the First Zionist Congress : Theordor Herzl and the Basel Declaration. Switzerland, from August 29 to August 31, 1897. 208 delegates and 26 press correspondents attended the event. It was convened and chaired by Theodor Herzl, the founder of the modern Zionism movement. The Congress formulated a Zionist platform, known as the Basel program, and founded the Zionist Organization. It also adopted the Hatikvah as its anthem (already the anthem of Hovevei Zion and later to become the national anthem of the State of Israel). The conference was covered by the international press, making a significant impression; the publicity subsequently inspired the antisemitic forgery The Protocols of the Elders of Zion. This gave clear expression to Herzl’s political Zionist vision, in contrast with the settlement orientated activities of the more loosely organized Hovevei Zion. To meet halfway the request of numerous delegates, the most prominent of whom was Leo Motzkin, who sought the inclusion of the phrase “by international law,” a compromise formula proposed by Herzl was eventually adopted. Editorial summarizing reactions by The Times’ many correspondents, Sep 4, 1897, four days after the close of the congress. The election of Herzl as President of the Zionist Organization and Max Nordau one of three Vice-Presidents. this out loud today l would be greeted by universal laughter. In five years perhaps, and certainly in fifty years, everyone will perceive it. 5. The Noah Pozner narrative : favorite song : Gangnam Style and Noah Pozners death certificate. Lenny Pozner has released Noah Pozner’s Death Certificate. 2 URL’s are required to show INClusive date calcs where more than 1 date component is used. 6. The Noah Pozner narrative : Reported birth date : Holocaust narrative : Anne Frank : Nazi arrest Commander, Julius Dettmann. Annelies Marie Frank ( 12 June 1929 – February or March 1945 ) was a German-born diarist. Girl ( originally Het Achterhuis in Dutch; English: The Secret Annex ), in which she documents her life in hiding from 1942 to 1944, during the German occupation of the Netherlands in World War II. It is one of the world\’s most widely known books and has been the basis for several plays and films. On the morning of 4 August 1944, the Achterhuis was stormed by a group of German uniformed police ( Grüne Polizei ) led by SS-Oberscharführer Karl Silberbauer of the Sicherheitsdienst. The Franks, van Pelses, and Pfeffer were taken to RSHA headquarters, where they were interrogated and held overnight. On 5 August they were transferred to the Huis van Bewaring (House of Detention), an overcrowded prison on the Weteringschans. Two days later they were transported to the Westerbork transit camp, through which by that time more than 100,000 Jews, mostly Dutch and German, had passed. Having been arrested in hiding, they were considered criminals and sent to the Punishment Barracks for hard labour. Julius Dettmann ( January 23, 1894 – July 25, 1945 ) was a German Schutzstaffel ( SS ) officer in the Sicherheitsdienst ( Security Service; SD ). Dettmann was a member of the Nazi Party ( NSDAP ) and his Party number was 722,240. On August 4, 1944, he received a phone call reporting that there were Jews hidden on the premises at 263 Prinsengracht in Amsterdam. The people in question were Anne Frank, her parents, sister, and four others. He immediately dispatched a squad led by SS-Oberscharführer ( staff sergeant ) Karl Silberbauer, telling Silberbauer that the call had come from \”a reliable source\”. Silberbauer and his contingent of NSB plain-clothes officers raided the building and arrested the eight in hiding who, after questioning at SD headquarters, were deported to the Westerbork transit camp and from there, to the Auschwitz concentration camp. Eliphalet Remington I, born in Hartford Co., CT ! The patriarch of the Remington Arms Co family was Eliphalet Remington I, born on October 13, 1768 in Suffield, Hartford Co., CT ! His son, Eliphalet Remington II founded the Remington Arms Co. ( see links above ). Can you tell me about the provenance of this document ? Do we know where Wolfgang Halbig got it from ? offloaded at a site. Why were the potties even needed? Didn’t the school have nice clean toilets… enough for 600 students? There was even had a gym with showers. No photo of that infamous day shows more than a couple dozen kids at most. Remember a group of kids were bused down the street to failed local actor Gene Rosen’s house for juice and cookies. I digress…sorry. I guess if you request a few portable potties, your name on the order invoice is Top Secret. I suppose that’s a blessing in disguise. You wouldn’t use a bathroom in a crime scene. For those who think it was a drill made to look real, you still wouldn’t use a school bathroom, since it was supposed to look like a crime scene. Name those deciduous trees with leaves on and green in mid-December. What about the Noah/Spiderman video? You quoted someone named “Anonymous” whose conclusion was that Noah born in 2006 could not possibly see a movie made in 2002. Do you see anything wrong with “Anonymous” conclusion? Hey, schlub. Your reference article says “certain trees can hold their DEAD leaves on over winter”. You are a real jerk if you think anybody considers you anything less than a lousy shill. In this one minute video of an aerial shot clearly shows the porta potties being delivered on the morning of Hoax Day at the school…..Dec 14, 2012….as I said before there’s a shill on this site posting one prevarication after another. The video shows what look like a porta potty on the back of a truck parked at the firehouse, not being delivered anywhere. And that video is after the shooting. The theory is that the porta potty was placed at the school before the morning of the 14th. Don, you said there were state police uniforms in Nancy’s closet, you have any photos to prove that? That’s a porta potty being removed in the dash cam photo above. The date is after Hoax Day. They either have to service the potty or remove it. What with all the food and drinks, the potties were in great need. Its very possible the potties were delivered on Hoax Day. Who knows, maybe someone made an emergency call. The potty company would not reveal to Mr Halbig who ordered the potties. People who request potties are evidently very sensitive about who knows this. So embarrassing. At least our resident shill keeps us slightly entertained with his deep bunny rabbit hole comments…..keep’em comin’. Don, why did you make the comment about state police uniforms being in Nancy’s closet? Porta potties could also have just been donated to them, since with all the people there, porta potties would have been needed. They would not have used the school bathrooms, as you suggested Don. I’m not on this blog site maintained by Dr. Fetzer to answer random questions about something I read on a website in 2013 or whenever. 95+% of all informative info on Sandy Hook has been scrubbed clean from the Internet. The crime ridden rogue state of CT is desperate to keep the Sandy Hook hoax-crime circus alive. I recently posted on Face Book a new photo of the ”dead” SH kids….all grown up and at or near college age. The famous Noah was seen in the photo with his SH chums. FB panicked and deleted that photo and put me in FB jail for 72 hours. FB also threatened me that if I did that again I would be severely punished or even banned from FB for life. FB jail can often last for weeks, months or forever. The US Government has allowed private companies to void the US Constitution and dictate what the common citizen can or cannot read or speak. The US has descended into a type of hell that only a member of the National Socialist German Workers Party could lust for. If you ask people questions and expect answers, then you should also be able to answer questions asked of you. Don, You have said a mouthful there….other than a prayer for critical mass, I perceive no way to halt this madness. As far as “Bob” goes…best to ignore his posts…. Why should I answer questions posed by the shill above who disputes almost everything I say? If sincere seeker of truth wants to know my opinions about the hundreds of anomalies of Hoax Day, before, during or after, I am happy to oblige. I wonder if Jones will be allowed to show evidence that Wheeler played the role of two different people in the Sandy Hook saga? Its well known that Wheeler is an actor and appeared in several TV dramas….and that Wheeler was acting on Hoax Day at the Sandy Hook School. Will the defendant be able to show current photos that the ”dead” kids are still alive and can these same kids be ordered to appear at the deposition? If not, then this deposition is a farce….and cannot arrive at the facts and truth. Will the Deposition of Jones be a steep descent into the theater of the absurd? Only opinion, of course, but I doubt Jones will take a stand the way James Fetzer will. No disrespect to Jones, as I think his “method” serves a purpose. But when push comes to pull, he’ll protect his standing and back off. Jones is an odd duck. His persona is wildly manic. He always seems to have had too much coffee to drink. What TV dramas did Wheeler appear in? Aldenberg was the sniper, not Wheeler. the ears, nose and scar near lower right lip all match Aldenberg. The Sandy Hook funerals and Barack Obama’s VP, Joe Biden. Avielle Richman – no funeral found so far. Adam Lanza December 31, 2012 – body reported to have been claimed by Peter Lanza – no funeral found so far. Joseph Robinette Biden Jr. ( born November 20, 1942 ) is an American politician who served as the 47th vice president of the United States from 2009 to 2017. On December 19, 2012, Barack Obama announced the appointment of his VP, Joe Biden to lead his Gun Control Task Force. We may never know all the reasons why this tragedy happened. Over these past five days, a discussion has reemerged as to what we might do not only to deter mass shootings in the future, but to reduce the epidemic of gun violence that plagues this country every single day. That’s why I’ve asked the Vice President to lead an effort that includes members of my Cabinet and outside organizations to come up with a set of concrete proposals no later than January — proposals that I then intend to push without delay. I asked Joe to lead this effort in part because he wrote the 1994 Crime Bill that helped law enforcement bring down the rate of violent crime in this country. That plan — that bill also included the assault weapons ban that was publicly supported at the time by former Presidents including Ronald Reagan. Sponsored by Representative Jack Brooks of Texas, the bill was originally written by Senator Joe Biden of Delaware and then was passed by Congress and signed into law by President Bill Clinton. The comment linked above on the Federal Assault Weapons Ban, shows that the reported Sandy Hook event occurred, 6666 days after Bill Clinton singed the Federal Assault Weapons Ban into law. Stanley Ann Dunham ( November 29, 1942 – November 7, 1995 ) was an American anthropologist who specialized in the economic anthropology and rural development of Indonesia. She was the mother of Barack Obama, the 44th President of the United States. It was reported that the body of the reported Sandy Hook perp, Adam Lanza, was collected on December 31, 2012 for a private funeral, by his reported father, Peter Lanza . The body of a gunman who killed 20 children and six adults at a Connecticut elementary school has been claimed by his father, a spokesman for the family said Monday. Note : Jim Fetzer was formally served with the Lenny Pozner law suit on November 29, 2018 – Stanley Ann Dunham’s 76 th birthday. The Noah Pozner narrative : favorite song : Gangnam Style and the First Zionist Congress : Theordor Herzl and the Basel Declaration. Theodor Herzl ( 2 May 1860 – 3 July 1904) also known in Hebrew as Chozeh HaMedinah, lit. “Visionary of the State”; was an Austro-Hungarian journalist, playwright, political activist, and writer who was the father of modern political Zionism. Herzl formed the Zionist Organization and promoted Jewish immigration to Palestine in an effort to form a Jewish state. Though he died before its establishment, he is known as the father of the State of Israel. Note : The date calculator cannot show INTerval type date calcs ( whole days between dates ), so the result date is always 1 day short. Sandy Hook funerals : Theodor Herzl’s friend and legitimizer William Hechler. Reverend William Henry Hechler (10 January 1845 – 31 January 1931) was a Restorationist Anglican clergyman, eschatological writer, crusader against anti-Semitism, promoter of Zionism, aide, counselor, friend and legitimizer of Theodor Herzl the founder of the modern Zionism. The first two reported funerals for the reported Sandy Hook victims, Noah Pzner and Jack Pinto, were reported to have taken place on December 17, 2012. Three days after it suffered one of the worst mass shootings in US history, Newtown in Connecticut has begun the dreadful process of burying the 27 victims on Monday, starting with two of the young children to be killed in their classrooms at Sandy Hook elementary school. One of the two boys was the youngest of all the children to have died, Noah Pozner, who turned six last month. The second funeral was for Jack Pinto, also six, whose main passion had been the New York Giants American football team. There is a curious adjunct to the reported Noah Pozner funeral. December 16, 2012 was also the day of the Newtown memorial service, where Barack Obama vowed to use whatever power his office holds to prevent more tragedies like Sandy Hook. The day after the first two funerals, on December 18, 2012, the website domain noahpozner.com was registered. MG…What does all this mean? Willy asks : What does all this mean? The relationships between events in a narrative are evidence of design. 2) Ownership and responsibility for the main event. The 6666 day relationship from the start of Bill Clinton’s / Joe Biden’s, Federal Assault Weapons Ban to the Sandy Hook event, indicates that the complaint is rooted in the Federal Assault Weapons Ban. Self-evidently, the complaint is that assault weapons are still legal. The main event, in this case the Sandy Hook production, is therefore an attempt to remedy the complaint. So, can this Gematria, numerology or Kaballistic hocus pocus make these events predictable? Or is there some hidden key that allows it to be exposed in only in retrospect? The Holocaust narrative : Nazi : Richard Glucks : Concentration Camp Death Certificates and the Sandy Hook narrative. Events in the 9/11 War of Terror / Al Qaeda / ISIS / mass shootings and many more narratives, carry the usual Kabbalistic signatures to root events in the Holocaust narrative. Hence, events in the Holocaust narrative are among the principal complaints which form the motivation for these false flag type events. This may appear to contradict the conclusions drawn from the exposure of other event relationships. For example, the Sandy Hook event is self-evidently rooted in gun control, specifically Bill Clinton’s / Joe Biden’s Federal Assault Weapons Ban. Bill Clinton’s ( and Joe Biden’s ) Federal Assault Weapons Ban and Sandy Hook. From the abundant post Sandy Hook statements made by Obama, Mayor Bloomberg et al, it is clear that these shooting events are used to further promote gun control. Sandy Hook was used as the motivation for Sen. Dianne Feinstein to resurrect the Clinton / Biden, 1994 Federal Assault Weapons Ban, when she introduced the new version of the Bill on January 24, 2013 – just 41 days after the reported Sandy Hook production. It should be no surprise therefore, that the very same motivations are evident in the relationships between events in the narratives. These Kabbalistic event relationships, reflect real world events, because the narratives are designed that way. – How are similar relationships from events in the Holocaust narrative to be interpreted ? The answer is that they should be interpreted in the same way that the relationship(s) from the Federal Assault Weapons Ban are, because they also form the principal complaints and motivations for the main event. The main presentation difficulty with publishing narrative event relationships which are rooted in the Holocaust narrative, is the lack of awareness among audiences of the Holocaust narrative. The world has heard of the famous Nazis, such as Hitler, Himmler, Goering, Goebbels and Mengele for example, but, outside of Holocaust studies, who has heard of the Nazi, Richard Glucks ? The attempts to embargo Sandy Hook information. There is abundant evidence that the CT and Newtown authorities resisted public access to the crime scene information and to the birth and death certificates for the alleged Sandy Hook victims. The project to keep the Sandy Hook crime scene information private. In various Sandy Hook FOIA cases, the CT State authorities attempted to characterise the reported Sandy Hook child victims as victims of child abuse, so that their names were afforded the same privacy by the provisions of Child Protection laws. These arguments were presented in their legal briefs during appeals against the CT FOI Commissions decisions, which ordered the 911 calls to be released. The official Sandy Hook report from Stephen J. Sedensky, the Danbury State’s Attorney, The Sedensky Report, also used the child abuse argument as justification for omitting the names of the reported child victims. A Connecticut judge ruled on Tuesday that the police must release recordings of the 911 calls made from Sandy Hook Elementary School during the shooting last year that left 20 children and six adults dead. Rejecting the state’s attempt to keep the content of the tapes confidential, the judge, Eliot D. Prescott of the Superior Court in New Britain, ruled that there was no legal basis to keep the tapes secret and found that their release would help the public assess the response by law enforcement. He ordered that the recordings be released on Dec. 4, giving the state time to appeal the ruling. Stephen J. Sedensky III, the state’s attorney in Danbury, who fought to keep the tapes private, said he was reviewing the ruling and had not yet decided whether the state would mount a challenge. The fight over the recordings has been one element in a broader struggle over information about the massacre in Newtown. A report on the police investigation of the shooting, released on Monday, had been repeatedly delayed. Some high-ranking state officials continue to plunder their credibility in their quest to shut the public out of the people’s business. The assault on the public’s sensibilities reached a Captain Queeg-like level of madness with the release of Danbury State’s Attorney Stephen J. Sedensky III’s investigation of the slaughter of 20 first-graders and six adults at the Sandy Hook Elementary School in Newtown last Dec. 14. Sedensky is on a crusade, and in any jurisdiction around the world there is nothing like the danger of a prosecutor who abandons reason to a cause. Sedensky and others have been battling the release of 911 call recordings and other documents from that horrifying day. One contrivance to achieving that ignoble goal is for Sedensky to designate the massacre as an incident of abuse and neglect under the state’s child protection laws. A consequence of Sedensky’s machinations is that he had to omit the names of the 20 children who were the victims of the lunatic Lanza in Sedensky’s long-awaited report. The document that will be referred to for decades as the most comprehensive and reliable account of that day that scarred the nation will not include a mention of Charlotte Bacon, Daniel Barden, Olivia Engel, Josephine Gay, Dylan Hockley, Madeleine Hsu, Catherine Hubbard, Chase Kowalski, Jesse Lewis, Ana Marquez-Greene, James Mattioli, Grace McDonnell, Emilie Parker, Jack Pinto, Noah Pozner, Caroline Previdi, Jessica Rekos, Avielle Richman, Benjamin Wheeler and Allison Wyatt. These obstructive efforts should be a red flag to all reasonable people. To Sandy Hook skeptics, these efforts support the idea that the entire Sandy Hook production was an elaborate charade. But is there something more then simple obstruction and post event management going on here ? The Holocaust narrative : Richard Glucks : Concentration Camp Death Certificates and the Sandy Hook narrative. Note : This thread is not the place to discuss, challenge or attempt to qualify any of the official Holocaust narrative, so the orthodox Wikipedia type view is presented here, just as it is. Richard Glücks ( 22 April 1889 – 10 May 1945 ) was a high-ranking German Nazi official in the SS. From November 1939 until the end of World War II, he was Concentration Camps Inspector (CCI), which became Amt D: Konzentrationslagerwesen under the WVHA in Nazi Germany. As a direct subordinate of Heinrich Himmler, he was responsible for the forced labour of the camp inmates, and was also the supervisor for the medical practices in the camps, ranging from human experimentation to the implementation of the “Final Solution”, in particular the mass murder of inmates with Zyklon-B gas. After Germany capitulated, Glücks committed suicide by swallowing a potassium cyanide capsule. The Glucks order : Collective lists for Jewish deaths in CCs. According to the Holocaust narrative, Richard Glucks, as head of the Concentration Camp Inspectorate, issued an order to all camps to change the way they reported deaths up the chain of command. By order of the Reich Leader of the SS and Chief of the German Police, with the agreement of the Reich Security Main Office, the following general directions for dealing with cases of death in concentration camps are issued and all previous directives cancelled. As far as protective, or preventive custody for male or female Jews has been ordered by Office IV C 2 or Office V of the Reich Security Main Office, the names of the respective persons will be underlined in red on these lists, and the custody number of Office IV or V respectively will be quoted. The lists will be made up in order according to the day of death and will be submitted to this office after the end of the month by the 3rd of the following month. Express letters and concluding reports on cases of death of Jewish prisoners are thus dispensed with. 2). Reports on deaths of all other prisoners are to be submitted on the form used up to the present ( express letter ), one copy to the Reich Security Main Office, Office IV C 2, or Office V respectively and to the SS-Economic and Administrative Main Office – Department D. These forms will (be) sent regularly by normal post to the Reich Security Main Office, and to this office. In both cases, with regards to Nos. 1 and 2 it makes no difference whether natural or unnatural deaths are referred to. The direct information of the allocation offices by teleprinted for the purposes of informing the relatives, as far as prescribed, remains unaffected. The present report procedure on cases of death of Soviet Prisoners of War and Russian civilian labour is not changed. The Camp Commanders are personally responsible to the Reichsfuehrer SS and to me that, in spite of the decrease of reports, it is not forgotten in any camp office that the life of every criminal must be accounted for. SS Brigadefuehrer and Major General of the Armed SS. So, Richard Glucks, the Concentration Camp Inspector, issued as order instructing all CCs to change the way that they reported deaths. Notably, only Jewish deaths in the camps, were to be reported on a collective list. Note the date of the Glucks order : November 21, 1942 – the day after Joe Biden was born. See also : The Sandy Hook funerals and Barack Obama’s VP, Joe Biden. The funeral dates above should have read 2012 not 2010. Oh, is this in response to me? If it is, I apologize. I missed it, mainly because it was not posted as a reply to me, nor did this comment refer to mine directly. Nor, frankly, did it answer my questions. Well, I’ll just assume this deluge of information is directed at me. Let me formulate a response. One thing I just have to say though, if James Fetzer’s blog is not the place to question the holocaust, or anything else, then there is no longer hope for the world. Toni, I remain puzzled at what all this information is meant to accomplish. Maybe others do and will respond as it appears the poster does not wish to inform us. There seems to be much effort put into these posts, so to allow them to go without explanation is quite a waste. I guess I will leave it to the commenters more proficient at this type of thing to work it out. I was never very good at this type of deciphering. Willy, I concur with your thoughts here. It’s a waste not to use this information if it can be used at all. How someone can carry on this kind of work and NOT be curious as to its meaning is kind of baffling. To be honest, this is not the first time I’ve asked for an explanation of the significance of this arithmetic, and I’ve never received a satisfactory answer. I mean for YEARS I’ve been asking. Now I let people like Mark Gobell post on with their numbers. Whatever. But he doesn’t get to be a jerk about it when someone asks obvious questions. That’s when I take an interest. I haven’t had a chance to write my response yet, and now I have to go out. But I will respond to the Mark Gobell comment above when I get back. I always interpreted this to have something to do with “the revelation of the method.” Some false element in an event is made crystal clear for all to see. It evokes outrage and anger but nothing ever comes of it. But the plotters seem to always plan in elements that involve recurring numbers, and other overly blatant elements. I regard the “dancing Israelis” element in the 9-11 event to be another example of this kind of planning and exposition of false events. “The term, “The Revelation of the Method” was coined by the late James Shelby Downard, to explain the alchemical processing of a society by its Luciferian controllers. Political activities, which at first remain buried beneath a cloak of secrecy (think TPP) and when finally accomplished and secured are slowly revealed to the unsuspecting populace who watch, in horrified helplessness. It is often said that the “controllers” need to inform us of their intentions *before* acting them out, through predictive programming, such as the numerous scenes in so many movies, where clocks displayed the numbers 9:11 and in the films, “Escape from New York,” which even had a scene where Air Force One crashed into a building adjacent to the WTC – and then, there was the cover of the rap album which was a virtual mock-up of the televised scenes, seen around the world. The hidden history is unveiled via far-out tabloids and the Alternative Media thereby, the Revelation of the Method is accomplished: You’ve been “pwned” (to use the gamer slang term for “owned”). Here is an interesting take/analysis/explanation of this “Revelation of the Method”. I just see it as a way to be drawn deeper into the rabbit hole with no conceivable end. I’ve been following these paths for years…since I got on the WEB. As far as I can tell, it serves no purpose other than using our energies in ways that give us no satisfaction. I would rather be painting and creating rather than engaging in their sick, macabre games. At least I see a result…good or bad! As described, the revelation of the method can “insulate the Elite from the consequences of universal law” if they advertise their crimes to their victims beforehand through the use of symbols. It makes me laugh to think of anyone actually arguing this before God. “But, I said it before I did it!” (stomps foot) Pwned, all right. By the magical thinking of a five-year-old. I have no problem with supernatural explanation. My problem with the revelation of the method is that it claims that in the non-metaphorical world, we were once a free people with thoughts of our own but through hidden manipulation at some date left unspecified, we are now hypnotized. Well, other people are hypnotized. Those who can recognize the revelation of method are awakened to the nightmare of their own slavish minds cowering before symbols, which is just as the gleeful manipulators would have it. This is a powerful metaphor, but its insistence on temporality marks it as a pre-trans fallacy. * It confuses a supposed earlier, edenic state with a future ideal. Once, we were free-thinking individuals, uncoerced by hidden powers, but now we walk willingly in chains held by others. This is not the nature of consciousness, which does not recede in scope anymore than a child who reaches the age of reason can retreat from concrete logic. We may be buffeted by trauma and even knocked back in an evolutionary sense to primitive emotions and behaviors by real and simulated horror. But the capacity for the truth is not lost in this. The truth is how our collective consciousness expands to absorb and transcend the trauma. The pursuit of truth is how we drag each other along on our long slog to higher consciousness. We are marching up to heaven, the beautiful City of God. Well, I’ve made my way through your post with its many links to your previous comments. Your thesis that these numbers connect the officially authorized “Holocaust narrative” to subsequent events like 9/11 is undercut by your example of Glücks. The connection you make between the Sandy Hook event and Glücks’ order hinges on a date that you portentously reveal as “the day after Joe Biden was born.” Is this your best evidence? It seems tenuous and hardly worthwhile. But never mind. You’ve now named the arithmetic: “the usual Kabbalistic signatures.” Does this mean you believe these numbers to be mystical? That is, that they are not arranged by human hand? Toni…I appreciate your vigilance and ability to decipher these posts. I am not hopeful for a helpful reply. In general, I would expect anyone passionate enough to put so much effort in a comment would be just as passionate in explaining how these discoveries would be of some benefit. Unfortunately, I have had similar experiences with those involved in the “sovereign movement”…..any inquiry was always met with mystery and/or, “figure it out…I did!. That’s funny about the sovereign movement. I didn’t know “there was no there, there.” I haven’t engaged with them but I’m familiar with the “if you don’t know, I’m not gonna tell you” line of… I don’t even know what to call it… retort? I’ve always thought you can tell a fake by an unwillingness to share information. Like there’s some kind of special knowledge that if you don’t get it, you’re stupid or unevolved or unenlightened. It’s as if you must acquiesce to the veracity of some mystery before you even have knowledge of it. Usually it’s to sell something, like access to ‘higher knowledge.’ Sometimes, maybe like the sovereign movement, it’s to define a group of believers by their purity, like in a cult. The more unquestioning the believer, the closer they get to the guru, metaphorically. Though it appears that Mark Gobell may have deployed the original insult in hopes he could block discussion of the very subject about which he repeatedly posts(! ), I don’t think he fits either of the categories mentioned above. I think he believes in the magic of it. He says these numbers are the “usual Kabbalistic signatures.” Despite his cavalier phrasing, we can be pretty sure he’s not debunking the subject, so he must mean that events are numerologically predetermined by a supernatural power. The other side of this doctrine is that the numerology must be satisfied for certain events to occur at all. So in this case, the Six Million number was impetus for the destruction of European Jews in furtherance of a jewish state. It’s said Hitler had occult pretensions, but I don’t think this number came from him. Search ‘Transfer Agreement.’ The nascent Israeli state was willing to sacrifice however many unfortunate co-religionists it took, and then posthumously proclaim them Holy Jews of Israel for having fulfilled Jewish mystical gnosis. It’s an evil, pernicious magic trick, and used to justify real murder in this, the natural world. Mark Gobell took exception, but it looks to me like you were right! Thank you for you perception and analysis. It’s intriguing, but for me, just leads no where. Could be he had his reasons for posting all those dates and figures. Beats me. “I called him out” because I felt it was not serving much purpose other than using bandwidth and diverting the conversation. IF he was to come back and explain his motive, I would certainly be willing to listen…but I would rather engage in a two way conversation that led somewhere rather than just be bombarded with data that means zip to me. Toni……I did post a response to DachsieLady, but it was not published. I am not sure why. It had a link to what I considered a fairly good explanation of ‘the revelation of the method’………basically, I said I see it all as a distraction…as engaging as it might be. Follow those things and the rabbit hole becomes bottomless…which is exactly what they (MG?) want! Willy, about two out of four of my submitted comments actually get posted but have stopped trying to understand the moderation system here. Discounting the “revelation of the method” as a distraction is okay but not really helpful. It is best to discover and reveal patterns in examining all the false events of the last half century. The more common characteristics and patterns we find and bring to light, and that includes finding and revealing what are called “distractions”, the better we exercise the power of truth. My basic take on the “revelation of the method” comes down to certain elements planned in to the false event that are patently revealed and made obvious or glaring so as not to be missed or overlooked. These revelations curiously all point to clearly identifying and exposing the perpetrator of the event while at the same time conveying the frustrating reality that we are helpless to do anything about it as all of our governmental structures for law and order are apparently also in the fatal clutches of the perp team. Distractions serve many useful purposes so they are not without strong power to deceive. Though I regard the supernatural as reality and the Divine and the Demonic as very real, I do not often analyze events from that perspective, regarding just using whatever God given reasoning skills I have to expose facts to contribute to truth as the better portion. The ancient mystery religions are alive and well and there is considerable evidence that our human world controllers believe and practice these belief systems, and these systems appear to receive power from supernatural forces and sources as well as power from simply human wealth and influence. then you may have issues comprehending further explanations. There was no reason for an insult. You have fallen into the divide and conquer trap. Sure hope you are not a teacher. Yeah, but what is “simple date arithmetic” good for? You’ve said you think it’s indicative of design, but do you really need these numbers to see the design? The line between assault ban legislation and the Sandy Hook event is pretty clear to everyone on all sides of the issue. Not sure what the purpose would be of contriving an additional arithmetic date relationship, which is, as willy suggests, only revealed in retrospect. Perhaps you could elucidate the significance. In addition to appearing to be extraneous to the ‘mission’, it seems to me that the work needed to achieve this kind of date rigging, would require an herculean effort on the part of someone. Who do you think that is? And what is their purpose in arranging these dates? What does it do for them? What does it do for us? Can it be used to predict events? Does it identify perpetrators? Can it bring them to justice? Or is it meant only to spook us? You obviously find it meaningful. Tell us what you think it means. Thank you. I also thought it was a simple request given the incredible amount of bandwidth involved. Call it simple arithmetic, Gematria, numerology or some sort of Kabbalistic (spelling corrected from previous post) coding, I have never seen it amount to much of value. I could be wrong and that’s why I asked the question. I would think it’s more valuable to work together on these things. You’re right, of course, and right to ask the question, which is why I followed up on it after he insulted you. Let’s see if Mark Gobell has an answer. 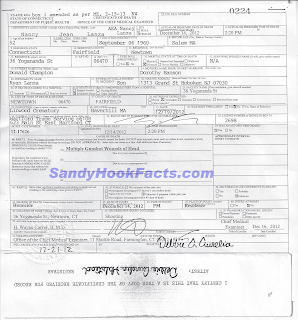 The Holocaust narrative : Concentration Camp Death Certificates and the Sandy Hook event. See also : The Holocaust narrative : Nazi : Richard Glucks : Concentration Camp Death Certificates and the Sandy Hook narrative. The Glucks / Sandy Hook post linked above is based on the NO-1543 order on November 20, 1942, from the Nazi Inspector of Concentration Camps, Richard Glucks. The new guidelines concerned the procedures for reporting deaths in the concentration camps, with only Jewish deaths to be reported in monthly batches on a collective list. This reference indicates that the Glucks NO-1543 order was the third in this chain. the second order, from the Gestapo office in the Reich Security Main Office aka the RSHA. This RSHA Gestapo order of November 13, 1942 is the subject of this post. • IV relates to the RSHA Amt IV = Department or Office IV of the RSHA, which was the Gestapo. • C is Department C ( Administration and Party Affairs ). Presently, unlike the Nuremberg NO-1543 linked above, no image has been found of this second order in the chain. It is mentioned in one of the Holocaust Handbooks, Volume 33 Healthcare in Auschwitz : Medical Care and Special Treatment of Registered Inmates. The Glucks NO-1543 Sandy Hook post linked above, showed the 666 month, 666 week, 666 day relationships from the Glucks order NO-1543 of November 21, 1942 for Collective Lists for Jewish Deaths, to some of the reported Sandy Hook funerals. You don’t say what it means because it has no meaning. Lenny Pozner, Sophia, Arielle, and Noah listened to his favorite song, Gangnam Style during the drive to school. Sandy Hook victims’ names released. Note : The date calculator cannot show INTerval type date calcs ( whole days between dates ), so the result date is always shown as one day short. Two URLs are required when showing INClusive date calcs when using more than one component. And this river of verbiage means what, Mark Gobell? Do tell us. I don’t like to say this, but I think someone should….why does James allow this to continue? It’s just spam as far as I’m concerned. On top of that, it’s quite disrespectful of fellow posters to not reply to inquiries.